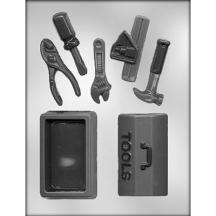 Each piece is Tools 1" x 3" x 1/4", Tool Box 2-1/2" x 3-3/4" x 1-3/4". Estimate 25 pieces per pound of chocolate. Love the concept. Thought mold would be bigger. Hate the shipping! Stuffing plastic mold in a bubble envelope and shipping for $10 and took over a week to get STS response: Molds were shipped per customer instructions. 3D TOOL BOX & TOOLS it's awesome love it, sweet treat is the BEST AWESOME WORK FAST DELIVERY AWESOME MERCHANT. I LOVE SWEET TREAT SUPPLY. Was very well made, clear features, unmolded easily, husband Loved it!